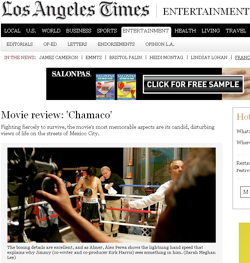 Follow the Los Angeles Times review link by clicking on the image. 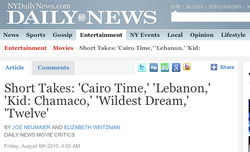 Follow the Daily News link by clicking on the image. 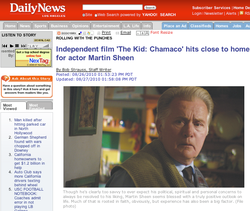 Follow the Los Angeles Times article link by clicking on the image. … Guillermo Granillo’s photography is gleamingly earthy"
Follow the New York Times review link by clicking on the image. Follow the Chicago Tribune review link by clicking on the image. Follow the New York Daily News link by clicking on the image. "The overall reaction of the Latino audience and in particular the Mexican public has been very good, very fast because they identify with the film and the main character, narrates Necoechea. "Les da gusto ver una película donde este personaje logra hacer realidad su sueño". "I am happy to see a movie where the character achieves his dream." 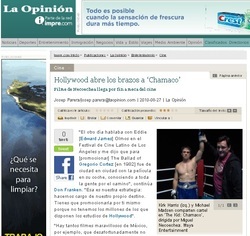 Follow the La Opinion link by clicking on the image. Follow the Fight Week link by clicking on the image.